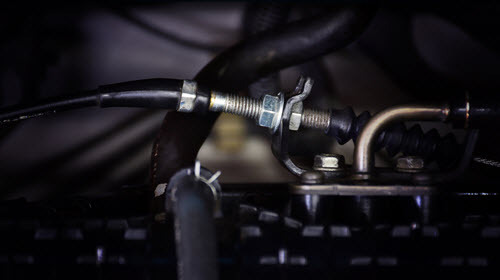 Your car’s accelerator cable, also known as a throttle cable, is a braided metal wire that connects the gas pedal to the engine throttle plate. By applying and releasing pressure on the gas pedal, the driver is able to control the speed of the car. Although many newer cars use an electronic throttle control system, accelerator cables are still frequently used in cars to control the engine. You use the accelerator cable in your car constantly while driving, no matter how long the drive. Because of this, the accelerator cable can endure a great deal of wear from friction as a result. The accelerator cable is vital to maintaining the quality of your car’s of drivability. If your car’s accelerator cable is beginning to wear down, or fail, it will create noticeable issues when driving. When the accelerator cable fails, it will physically break or snap. It is generally uncommon for this to occur without some warning signs. Before it breaks, it is likely that there will be signs that the material of the wire is wearing down and that there may be a problem with your accelerator cable. If your car uses a physical accelerator cable to activate the engine, then it will also use a cable to operate the cruise control function. Issues with your car’s cruise control capability is a sign that your accelerator cable is beginning to fail. You may notice that your car jerks when using cruise control. You may also notice sudden changes in the tension when you press on the gas pedal. These issues with your cruise control could be a sign that your accelerator cable is beginning to wear down. Another sign that your accelerator cable is beginning to fail is a delay in your engine’s accelerator response time. You may notice that your engine doesn’t respond when you are pressing down on the gas pedal or you may have to press the gas pedal all the way down in order for the engine to accelerate. The engine should respond to pressure on the gas pedal immediately. If the accelerator cable is starting to stretch or wear, it could delay your engine’s response time and serve as a signal that your accelerator cable is failing. Some signs that your accelerator cable is failing will have impacts on the drivability of your car. Otherwise, you can examine the physical state of your accelerator cable to determine the cable’s wear. The accelerator cable is a braided metal cable, covered in rubber to protect the cable from other engine parts. Though this rubber material is meant to protect the cable, its durability does begin to wear down over time. You can take a look at your accelerator cable and see if you notice any damage or wear on the material covering the cable. If you do, it could be a sign that the metal cable has been damaged. The accelerator cable will continue to endure friction, leading to more wear and possible breakage, if the problem is not addressed. The accelerator cable in your car is quite durable. It can generally be expected to last 5 years before needing to be replaced. However, this depends greatly on how often you drive your car and for how long. The more you drive your car, the more wear the accelerator cable endures and the more likely it is to fail. Since this part allows you to control the speed of your car, it is necessary to keep your accelerator cable maintained, or replaced, if necessary. If you notice any of these signs that your accelerator cable is beginning to wear, you should have your car examined by a professional mechanic. their customers maintain and repair their vehicles at our Lawndale and Culver City locations, serving West Los Angeles and South Bay, CA. Although accelerator cables are quite durable, their impact on the drivability of your vehicle is huge and should be monitored carefully so that you are able to continue driving your car. When it comes to finding a professional mechanic that you can trust, Import MotorWorx provides you with quality mechanics, at a price that you can afford. Drivers all over West Los Angeles head to Import MotorWorx for our impressive work, knowledgeable mechanics, and exceptional customer service. If you suspect there are issues with your accelerator cable, or have questions about other vehicle repair, check out our Lawndale or Culver City location to see why drivers all over South Bay, CA are choosing the mechanics at Import MotorWorx.